Product information "Zomo Ragga Bag"
With the Raga Bag Zomo has created a very chic bag, which has space for about 150 pieces of 7" vinyl singles. The perfect protection on every trip. The 2.5 cm inside foam is protecting against hits and high temptreture. The inside pockets are offering enough space for headphones, cartridges or any other kind of equipment. 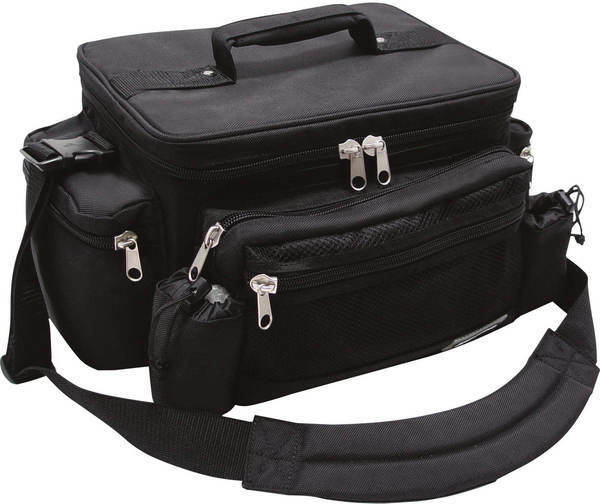 The massive shoulder strap and the padded handle are perfect for a very comfortable transport. At the back of the Ragga-Bag you can find a back leash, closable by a zipper - the perfect way to fit the Ragga-Bag "on top" of every DJ- or travelling trolley(very usefull). Customer ratings for "Zomo Ragga Bag"
Habe den Bag für meine Kleinbeschallungsanlage gekauft. Hier passt einiges rein, z.B. : meine ganzen XLR Kabel für die Anlage, sowie 2 Mikrofone. Dazu macht er einen ganz soliden Eindruck und sieht schick aus.